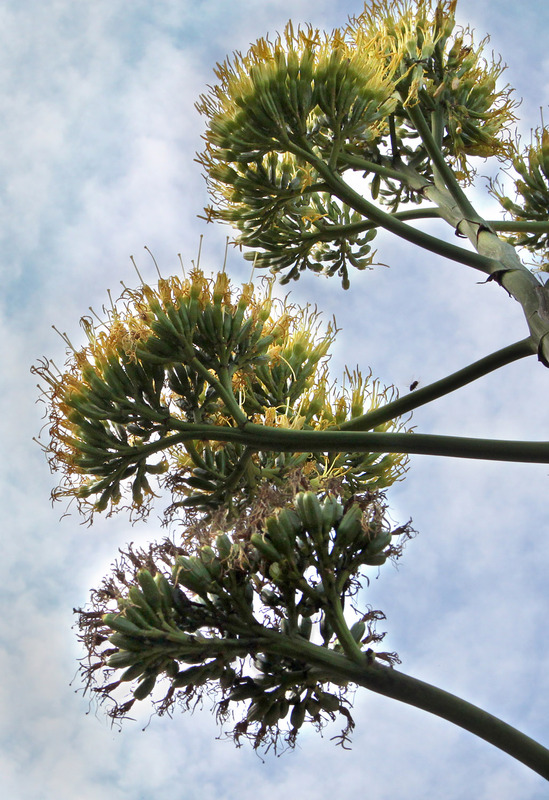 The original native range of Agave americana is Mexico, where it is still used as a healing plant. Indigenous people used the plant sap to treat warts and ulcers. Today it is cultivated worldwide as an ornamental plant. It is also known as centuryplant, maguey and American aloe, though it is not related to the genus Aloe. Agave plants live 10-30 years. They are used to dryness and can take long drought periods. The gray-green leaves get 1 to 1,5 m long and have a prickly margin. The leaf tip is especially sharp and is described as being able to “pierce to the bone”. The plants flower only once, at the end of their life cycle, then sending up a single branched stem, which reaches up to 9 m in height and is full of yellow blossoms. The not yet flowering stem contains a sweet liquid juice, which is called aguamiel, “honey water”. The juice is fermented to a drink called pulque. The leaves also yield a fiber, named pita, which is used for making ropes and in traditional leather embroidery work, called piteado. Agave americana is, together with other agave species, employed in the production of high percentage alcohol. The plants are then referred to as mezcales and the product of agave distillation is called mezcal. Recently certain types of mezcal are being flavored with the mezcal worm. The mezcal called tequila is won from the blue agave (Agave tequilana) and does not contain such worm . Agave nectar (or agave syrup) is rich in fructose and is sold as a natural form of sugar. In nature the seeds germinate and grow while still attached to the flower stalk. 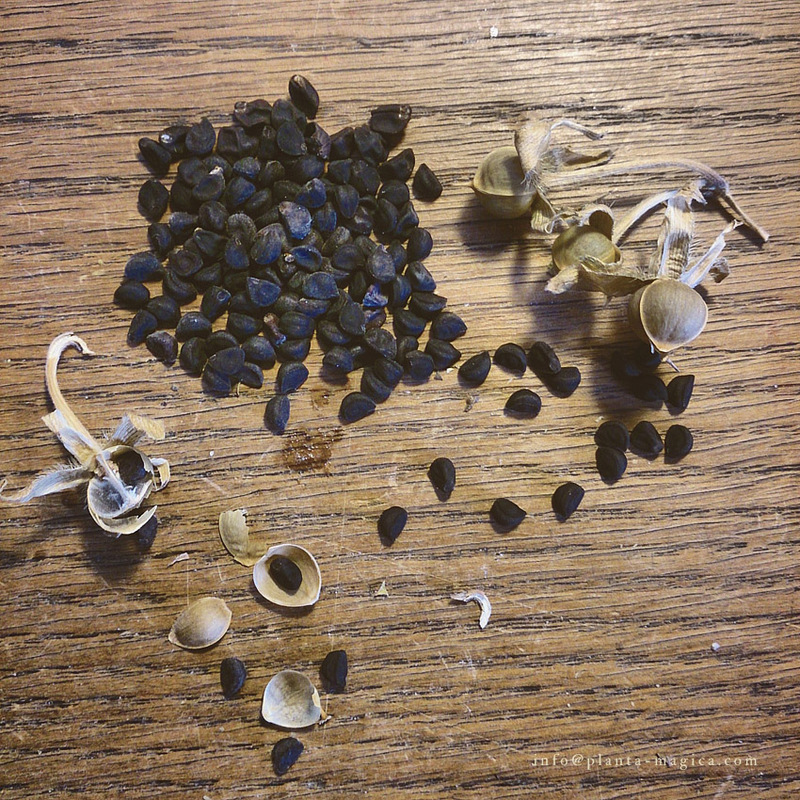 The seeds are flat, black and, depending on the size of the mother plant, can be quite large. Cultivation: The seeds require light to germinate. So cover only with a thin layer of substrate, just enough to keep them moist. Use cactus sowing substrate. (One source recommends a mix of equal parts sterilized soil and crushed granite.) Put in a warm and well lit spot (but avoid direct sunlight). Keep the substrate moist but not soppy. For watering, place the tray or pot in a bowl with water and wait until the soil is saturated. Remove it and let it dry a bit. Then place in growth tent or cover with transparent plastic foil to provide stable air humidity and temperature. Air out, so the seeds don’t get moldy. Avoid changing light conditions abruptly. Instead adopt them slowly to new light conditions. The seeds germinate fast. If nothing happens after 2 weeks, the seeds are probably not viable. Remove the foil, as soon as the seedlings show. The seed husk may stay attached to the first leaf. Leave it on and wait until it falls of by itself or remove it carefully, so as to not damage the seedling. The seedlings tend to fall over. Use sand to stabilize them. 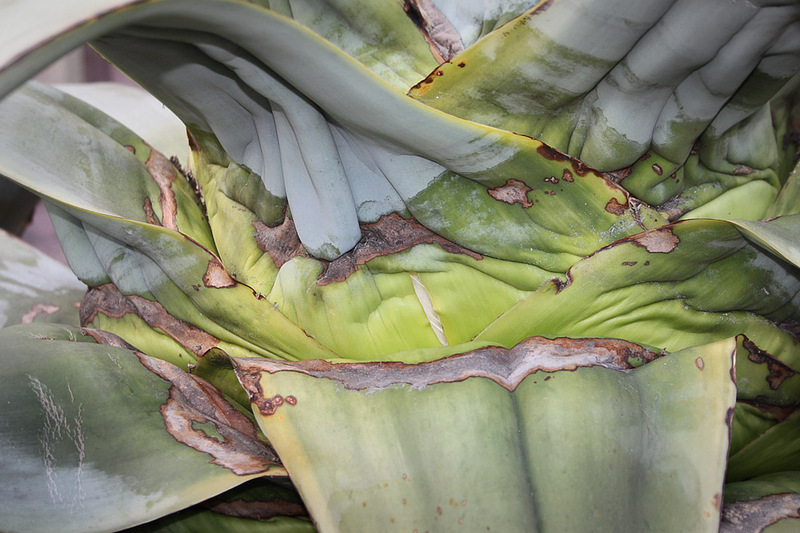 After 2 – 4 weeks the second leaf emerges, already looking like an actual agave leaf, but without spines. The third leaf already has spines on its margins. When it shows, the first leaf begins to fade. Annual to perennial, native to the tropic and Southern tropic regions of America, with white or light yellow flowers, which develop into a pappus with about 20 tubular seeds, bearing feathery bristles. The Chontal people of Oaxaca call the herb Thle-pela-kano, ‘Leaf of God’, and use it in oneiromancy, e.g. for divining the cause of an illness or the whereabouts of a lost person. Due to the acrid bitter taste of the leaves it is often smoked as a cigarette rather than consumed as a tea. The effects are described as calming, mind altering, mood enhancing and dream inducing. Also known as ‘Bitter Grass’ and ‘Traumkraut’. Cultivation: The seeds need light, warmth and moistness to germinate. Scatter the seeds on a mix of equal amounts of rich substrate, vermiculite (or sand) and humus. Make sure the soil and pot are well-drained. Or carefully place the seeds upright in the soil, with the seed immersed and the feathery tip pointing to the top. Moisten moderately with a sprayer (do not water with a can), then place sowing container in a humidity tent (or under a transparent plastic bag), in a warm and well-lit place. Make sure the seeds do not fall dry and are kept moist but not wet during germination. Air as often as possible to prevent seeds and young seedlings from getting moldy. The young seedlings are fragile, react sensitive to change of climate and have thin roots, which are easily uprooted. Take them out of the growth house or remove plastic foil once grown to about 1 cm. Fanning the seedlings is said to help them develop stronger stems. Continue watering with a sprayer. Do not touch the roots when replanting. Safe remaining seeds as they may germinate later. Young plants can be transplanted to any soil. Just make sure it’s well-drained. Take care to not damage or squeeze their roots. After transplanting to larger containers place them inside the humidity tent for just a couple of days. Then take them out and give them a place in semi-shade to grow. Nutrients will aid the plant’s growth and development of its roots and leafs. Annual to perennial, bushy plant native to Northern South America. 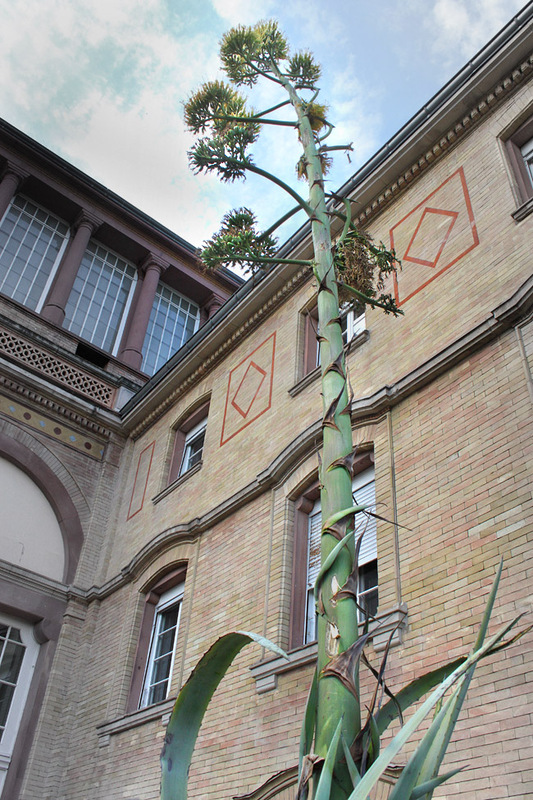 Grows up to 1,20 m tall. The foliage is strongly aromatic (slightly unpleasant). The small yellow flowers appear from spring to late summer and bear tiny dark-red to black seeds. Epazote is antiseptic and common in Mexico to flavor beans with. Also called ‘Herba Sancti Mariæ’. Cultivation: The seeds need light to germinate. Sow flat on seeding compost, press seeds on and do not cover. Put them in a warm and sunny spot and keep moist but not soppy. Separate young plants and transfer them to larger pots or plant outdoors when strong enough, in full sun or half shade. The soil can be normal to sandy and should be well-drained. Annual to biennial, native to Northern South America. Grows up to 1 m tall, with round leaves and bright yellow flowers from June to late autumn. The seed capsules contain 100-200 seeds each. Mapacho is smoked together with Tagetes lucida by Mexican shamans and was famous amongst Russian soldiers in WW II. In Vietnam it is used as pipe tobacco and also known as ‘Thuoc Lao’. The leaves contain up to 9 times as much nicotine than normal tobacco. Its commercial distribution is prohibited in Europe. It is also known as round-leaf tobacco due to the round shape of the leaves. In German it is also known as ‘Bauern-Tabak’. Cultivation: the seeds need light to germinate. Sow seeds flat on seeding compost, press seeds on and do not cover. Put in a warm and sunny spot and keep moist but not soppy. Separate young plants and transfer to large pots or plant outdoors when strong enough, in sun or half shade. The soil should be normal and humus rich. Protect leaves from the noon sun. A place where the plants get morning and evening sun would be ideal. Harvesting tobacco leaves: Remove flowers. The plant will develop more foliage. Harvest leaves when they turn yellow, take only 2-4 leaves per plant. Hang the leaves in a cool and shady place until they are dried. for consumption the leaves would have to be fermented over the course of several weeks. Else they would contain too much nicotine and be health-threatening to consume! Warning: All parts of the plant contain poisonous alkaloids, especially Nicotine! Do not ingest and avoid skin contact! The flowers of morning glory typically open early in the morning and fade at noon. Some Ipomoea species open also in the middle of the night and are hence referred to as moonflowers. Best is to sow the seeds in a container, at least 15 cm apart. Beautiful arrangements can be made different variants, e.g. combine dark purple, blue and white flowers by planting one seed of each in a long container. Single Ipomoea plants can grow 2-4 m tall. They easily take over, if planted in the flower bed. The plants need climbing support! Make sure to water frequently, up to 2 times daily during the hot season. Perennial, fast growing, climbing vine, native throughout Latin America, from Mexico in the North to Peru in the South. The white flowers are dark at the center. They are pollinated by bees and produce a very aromatic honey. In their native region they will flower from November to February. The plant is therefore also known as Christmas vine. But the flowering time can vary, depending on the region. Fast growing, it prefers warm and tropical climates and reacts sensitive to cold and dryness. It will not survive freezing. Winters of Central and Northern Europe will kill them. Grow as an annual or overwinter in a heated green-house. Also called Coaxihuitl, Snake Plant. The name Ololiúqui means ‘round thing’ and refers to the shape of the seeds. They contain psycho-active, LSD-like, ergoline alkaloids. The fresh seeds, ground and solved in water or alcohol, induce a trance-like state with hallucinations or a twilight sleep with vigorous dreams. Negative side effects are vertigo, nausea and vomiting. Rivea corymbosa has been identified as one of the flowers depicted on the Aztec statue of Xochipili, the Flower Prince and god of dances and divine ecstasy. Consumption may have helped Aztec shamans in divination and contacting the dead. The plant is still believed to ward off evil, break hexes and is grown for protective purposes in front of the house. It may also be part of Ayahuasca. Cultivation: prime seeds in fresh tepid water for 12-24 hours prior to sowing. Sow ca. 1,5 cm deep into seeding compost. Keep moist but not soppy, in a well-lit place. Germinate in a humidity tent or under transparent foil for stable humidity and temperature. Air out daily. Take out young plants once they have the first leaves and transplant to rich soil. Make sure to moisten regularly so they do not fall dry. Mature plants need space and growth support to climb. Plant in containers, in full sun. Use rich soil, fertilize once every month and remember to water daily, during hot summers up to 2 times a day. If planted out in the flower bed no such care is needed. Important: a single plant can reach enormous size within a couple of months and easily takes over the garden. Assumed to be a New World plant, thorn-apple has been used in ceremonies for contacting the spirit world and in rites of passage, but also as an ingredient in so-called zombie powders. Ingestion can be fatal or cause delirium and trauma for several days. The genus name is derived from ancient Hindu dhatura, meaning “plant”. Cultivation: Prime seeds in a baggie with tepid fresh water for 24 hours. Sow 0,5-1 cm deep into seeding compost. Place in a warm and sunny spot. Keep moist but not soppy. Increase temperature and moistness by placing the sowing pots in a humidity tent or under transparent plastic foil. Air out every day. Separate young plants when they develop the second pair of true leaves and plant into larger containers. The soil can be normal to rich. Move them outdoors after the last night frosts and give them a spot in full sun or half-shade. In my experience diffuse light under a tree is best – they’ll develop more foliage then. The roots are suspect to fungi, so make sure the containers you plant them in, have good drainage. Fertilizer is needed only, if the leaves turn yellow during growth period. Also known as Jimson weed and mad seeds, it fmously features in the books of Carlos Castaneda. The specific name stramonium comes from Greek strychnos, meaning “nightshade” and maniakos, meaning “mad”. There are two variants of Datura stramonium. The ‘stramonium‘ variant has green stems and plain white flowers. The variant named ‘tatula‘ has dark purple stems, the leaves are a darker green and the flowers have a purple tinge. 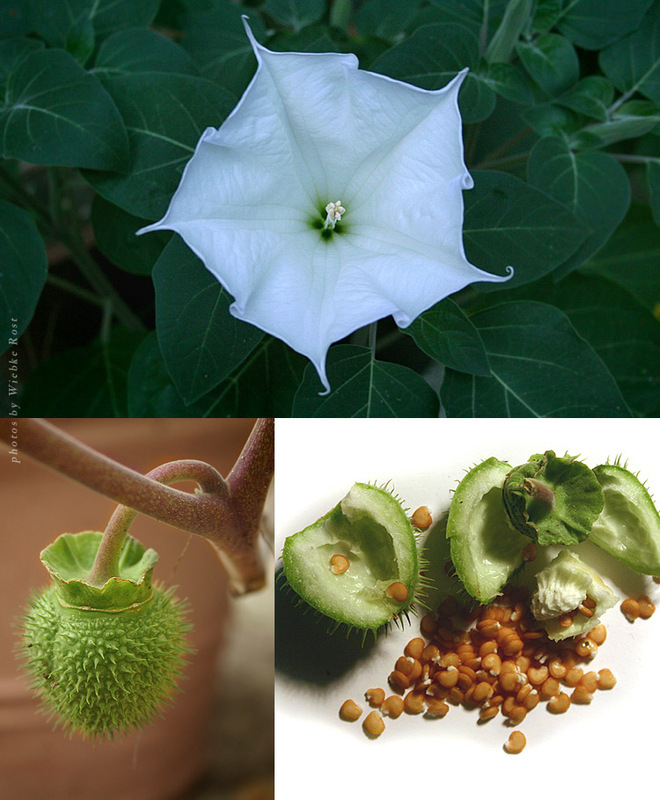 Also known as downy thorn-apple, tolguache or toloache, toloatzin and moonflower. The flowers are white and 10-toothed. The fruits are densely covered with spines and contain the orange-yellow seeds. The plant is pilose all over, which gives it a silvery gray appearance. Aztecs used it for healing purposes and rites of passage. 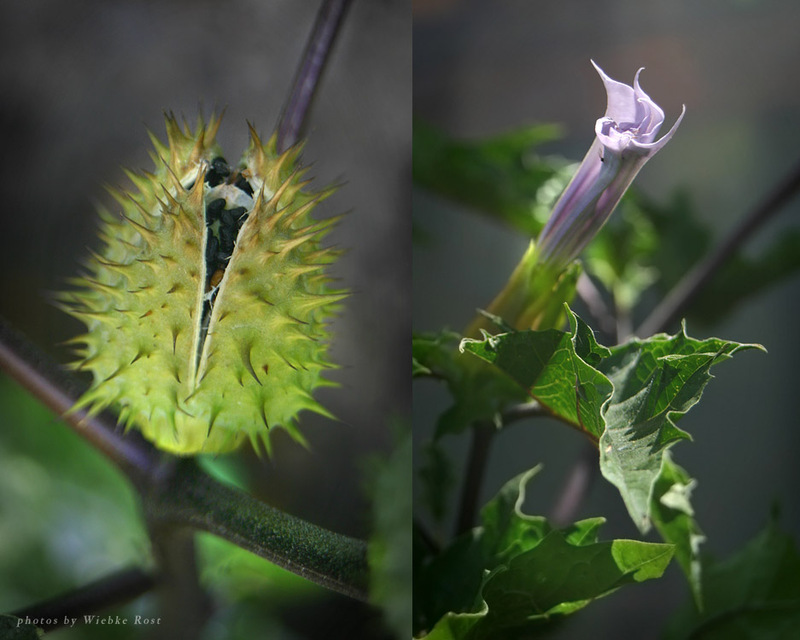 The sacred datura (Datura wrightii) looks similar to and is thought to be a subspecies of Datura innoxia. It has bright-purple tinged flowers, which are 5-toothed. 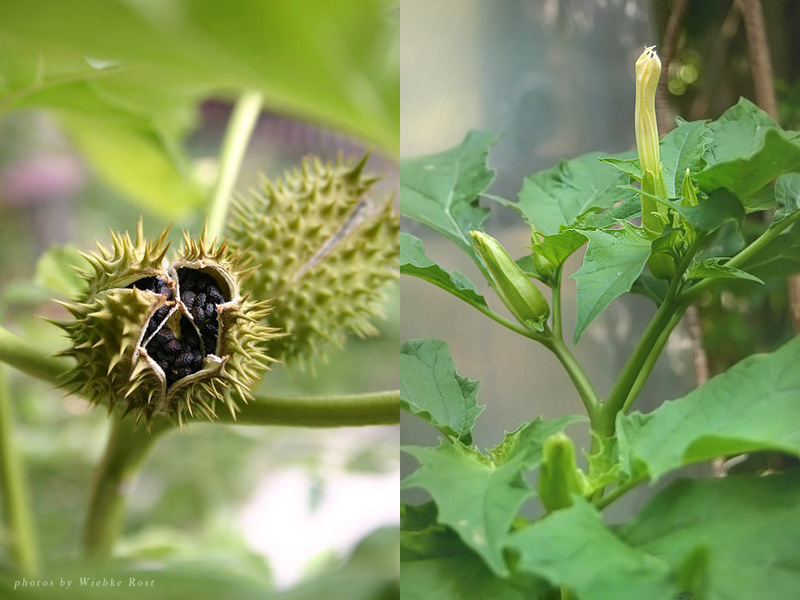 Warning: All parts of datura contain poisonous tropane alkaloids. An overdose can lead to coma and death. Do not ingest! Yarrow acts anti-phlogistic, styptic, anti-convulsant and soothing and was used on battlefields to treat the wounds of soldiers and stop nosebleeds. It is also diuretic and digestive, eases stomach pain, stimulates menstrual flow and the body’s metabolism and bile production. The dark blue essential oil is anti-inflammatory and used as a chest rub against colds and influenza. Yarrow is also diaphorethic and helps bring down fever. A Chinese proverb says Yarrow brightens the eyes and increases intelligence. The stalks are traditionally employed in casting the I Ching. Yarrow increases the medicinal properties of other herbs. In magic it is used as an amplifier, e.g. when added to incense for increasing the power of other herbs. General magical uses are for protection (e.g. when hung over the cradle of infants to protect their soul), divination, prophetic dream and in love magic. According to Homer the centaur Chiron taught Achilles (after whom the herb is named) to use yarrow in the battle of Troy. Legend tells yarrow sprung from the blood on his spear. Some alternative names are Bloodwort, Arrowroot, Death Flower, Devil’s Nettle, Nosebleed, Snake’s Grass, Soldier’s Woundwort, Thousand Seal, German Schafgarbe and Old English gearwe. Cultivation: The seeds require light to germinate. Sow them directly in the bed, after the last frosts have passed. Moisten regularly until the seeds germinate. Prefers a dry place in full sun and grows wild along waysides, on fields and wastelands. It thrives on lean, well drained soil and does not like heavy clays or rich and nutritious mediums. By removing faded flowers the plant is stimulated to produce more blooms. Divide and thin out every so often to avoid yarrow crowding out other herbs and flowers. The young leaves harvested in spring have a mild spicy aroma and can be added to soups and salads. Older leaves have a rather bitter taste and can be used in small amounts to season herb butter, soups and dips. The flowers are a common ingredient in herbal tea blends. Annual to perennial, native to Northern South America. Grows up to 70 cm, with lovely yellow-orange flowers all year round. The leaves are strongly aromatic, with a sweet anise-like flavor similar to that of Estragon, hence the herb is also called Winter-Estragon. The leaves are drunk as tea, added to hot chocolate and smoked together with Nicotiana rustica by Mexican shamans. It is also called ‘Cloudherb’ in Mexico. Acts as a mood elevator and has been compared to Salvia divinorum. ->germination temperature: 15-20°C, germination time: 4-8 weeks. Separate young plants and transfer to larger containers or plant outdoors when strong enough, in full sun and well drained soil. Fertilize if leaves turn yellow during growth period. Plants will not survive freezing but can be overwintered at 0-5°C and eventually keep flowering during the cold season. Cut back in spring.